HONOLULU — In the Aug. 11 Democratic primary for Hawaii’s 1st Congressional District (City and County of Honolulu), former Rep. Ed Case topped a crowded field and is expected to win in the fall general election. Rep. Colleen Hanabusa gave up the seat when she decided to challenge Gov. David Ige for the Democratic gubernatorial nomination. Ige won, 51 percent to 44 percent. Case, a lawyer, received 47,482 votes (40 percent), followed by Lt. Gov. 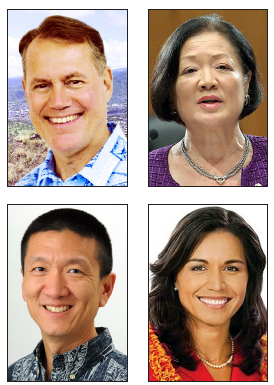 Doug Chin (30,283, 25.5 percent), State Sen. Donna Mercado Kim (21,554, 18.2 percent), State Rep. Kaniela Ing (7,531, 6.3 percent), State Rep. Beth Keiko Fukumoto (7,473, 6.3 percent), Honolulu City Council Chairman Ernie Martin (3,827, 3.2 percent), and Sam Puletasi (518, 0.4 percent). A native of Hilo, Case represented the 2nd Congressional District (rural Oahu and all of the other islands) from 2002 to 2007 and gave up his seat when he unsuccessfully challenged Sen. Daniel Akaka in the 2006 Democratic primary. He previously served as a member of the State House of Representatives, a legislative assistant to Sen. Spark Matsunaga, and a law clerk to Hawaii Supreme Court Chief Justice William Richardson. Fukumoto made national headlines when she quit the GOP over her opposition to President Trump and became a Democrat. The district’s Republican nominee is former State Rep. Cam Cavasso, who won his party’s primary with 10,552 votes (81.8 percent) to Raymond Vinole’s 2,340 (18.2 percent). 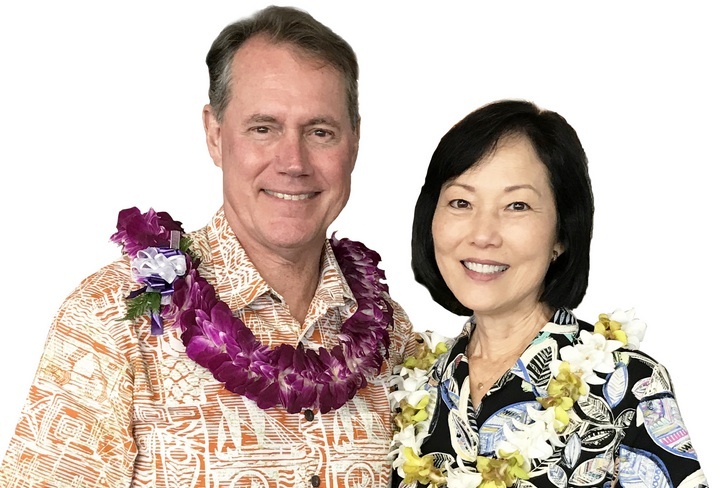 Ed Case and his wife, Audrey Nakamura. In the 2nd Congressional District, Rep. Tulsi Gabbard easily won the Democratic primary with 94,629 votes (83.6 percent), followed by Sherry Alu Campagna (13,936, 12.3 percent) and Anthony Austin (4,688, 4.1 percent). Her opponent in the fall will be singer and author Brian Evans, who was unopposed in the GOP primary. Gabbard, an Iraq War veteran, was first elected in 2012 and is the first Samoan American and first Hindu member of Congress. Sen. Mazie Hirono, who was also first elected in 2012, was unchallenged in the Democratic primary. An outspoken critic of the Trump Administration, she is Hawaii’s first female senator and the Senate’s first Asian American female member, the first senator born in Japan and the first Buddhist senator. Her Republican challenger will be retired computer programmer Ron Curtis, who won his primary with 6,365 votes (23.7 percent), followed by Consuelo Anderson (5,166, 19.3 percent), Robert Helsham (3,988, 14.9 percent), Thomas White (3,657, 13.6 percent), Rocky De La Fuente (3,060, 11.4 percent), George Berish (1,658, 6.2 percent), Michael Hodgkiss (1,575, 5.9 percent) and Eddie Pirkowski (1,357, 5.1 percent). In Hawaii, it is generally assumed that the winner of the Democratic primary will also prevail in the November election.